Factory96 is an incredible new FREE room escape game. Available Now on iTunes App Store and the Google Play store, for iPhone, iPad, iPod Touch, and Android phones, players and tablets. 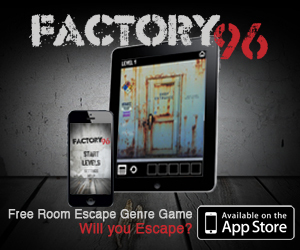 Factory96 is a “room escape” mobile app with a twist. Stuck in an old factory, your mission is to escape. In order to escape, you have to move through each area of the factory. Find the three-digit code that is hidden in each level by solving puzzles, moving objects and moving your device around. Once you think you have the code, enter it in the keypad to advance to the next level. Gorgeous graphics and challenging brain-teasers, combined with interactive elements such as rotating, tilting or even shaking your device are what make Factory96 different than the other room escape games in the marketplace. Give it a try. You’ll be happy you did, and because it’s free, there’s no risk. Try it now!